It is on this basis that schemes are established by the Ahmadiyya Muslim Jama’at (AMJ) to help the poor and needy in every way possible. The spirit behind voluntary sacrifices of the members of the Ahmadiyya Jama’at and their passion to help humanity, the poor and the destitute in every way possible is a reflection of the exemplary model set forth in the early stages of Islam by the Holy Prophetsa and his successors. The Ahmadiyya Muslim Jama’at prides itself in serving mankind through its various humanitarian projects throughout the world. ‘Love for All, Hatred for None’, is expressive of its enthusiastic spirit to provide aid and social justice to all those in need, without exception. This inspirational and guiding principle, which alludes to compassion and sympathy for all creatures of God Almighty, is a theme and motto that has become synonymous with the Community over the years. Khidmat-e- Khalq (Service to Mankind), a subsidiary of the Community’s central youth organization, Majlis Khuddam-ul-Ahmadiyya, is a representation of the motto that the Community abides by; And it is primarily through this vital subsidiary that the Ahmadiyya Muslim Community puts into action the very motto it promotes, in order to the achieve its objective of establishing peace, serving society and supporting the social structure of the global community. It is upon the above mentioned Islamic teachings that the Ahmadiyya Muslim Community aims to serve mankind in any way possible. Furthermore, with regards to the very purpose of Ahmadiyya Mosques around the world, which number more than 15 thousand, His Holiness has also stated in his Friday Sermon of February 24th 2012 that, other than the purpose of prayer services, Mosques should be used to plan and discuss methods by which the betterment of mankind can be achieved. 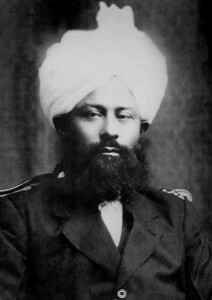 Thus, it is essentially a matter of completion of faith that members of the Ahmadiyya Muslim Community remain at the forefront of service to mankind, determined to achieve a higher objective. Councillor Josie Iles, Mayor of Medway, was present at the opening of Nasir Mosque in Gillingham and could not help but enumerate some of the Community’s services. She said: “Your Holiness, distinguished guests, ladies and gentlemen, it is a delightful and unique privilege to be here with you all on this special occasion. Local Muslim communities have been in the Medway towns for 50 years and as you celebrate this golden anniversary year, I should like to thank you for the service you have given and continue to give to the local community. Your hard work and efforts involve charity collections, blood giving donations, homeless feeding sessions, woodlands clean-ups and volunteer services in Medway Hospital and many other local projects. Medway truly appreciates what you do! You underline the very essence of its motto, ‘Forward Together’ and I quote, ‘By encouraging everyone to work together, to make the area a better place in which to live, work and play.’ Moreover, this is so strongly linked with your own motto, ‘Love for All, Hatred for None’, a desire for cohesion and peace, that we can see a good and respectable interrelationship that benefits us all.” Global Role of International Association of Ahmadi Architects & Engineers. The IAAAE-Europe is an international organization catering to the professional development needs of Ahmadi Muslim engineers, architects and technologists. IAAAE has played an integral role in serving mankind through various humanitarian projects worldwide. The organization was founded in 1980 by Hazrat Khalifatul Masih III, Mirza Nasir Ahmadra, to gather applied-scientists and researchers with the purpose of interpreting and correlating the scientific research in the light of the Holy Qur’an. Such an association was also considered essential in providing assistance to the Ahmadiyya Jama’at in meeting its architectural and engineering needs. In 2004, at the first symposium of its type in the Ahmadiyya Engineers Association, Hazrat Khalifatul Masih V, Mirza Masroor Ahmadaba directed the Association towards providing humanitarian aid and logistical support to the poorest of the world. Under his guidance, various committees were formed and undertook numerous projects around the globe. The Water for Life (WFL) Committee was established under the guidance of His Holiness in January 2005. Its major objective was to carry out research into establishing cheap methods of extraction of water for the people of Africa. Early on, the Committee recognised that to achieve this task, it would concentrate on rehabilitation rather than new pumps. In this manner, the Committee successfully regenerated almost 1,000 water wells alleviating over a million people in Burkina Faso, Mali, Niger, Kenya, Rwanda and Tanzania. The Alternate Energy Committee (AEC) is comprised of approximately 15 engineers who volunteer their time and services to it. To-date AEC has installed over 160 solar systems and a total of 500 solar lanterns have been distributed in deprived areas of Africa. The AEC also holds itself responsible for any maintenance services of these installations. For example, in the past year, 25 installations were repaired in DR Congo alone. Furthermore, maintenance services were provided for a total of 11 systems in Sierra Leone. Mosques: The Architecture Committee assisted in planning and designing construction of Mosques within Europe. Belgium (Brussels), Ireland (Galway), Holland, Spain, Portugal and Sweden, to name a few. This service was also offered outside of Europe. A Mosque in Tanzania was designed and technical guidance was provided for the Kampala Mosque in Uganda. Model Village Projects: The aim of these projects was to bring clean running water to the doorsteps of people and with it provide light not only in houses but in streets also. Water generated could also be used for irrigation allowing villagers to grow crops for their everyday needs all year round. In the deserts of Africa where this scheme was carried out, the impact was simply incomprehensible. Particularly for those people who had to travel up to 4-5 miles every day just to quench their thirst. Also through irrigation, people were able to grow cash crops thus helping them earn a decent living. Other than the clean water and light provided to the most remote areas of Africa, the Model Village projects provided computer training, sewing classes for women, street lights, vocational schools and other facilities. By 2011, a total of 210 solar energy systems were installed in various African countries, including: Ghana, Benin, Nigeria, Gambia, Mali, Sierra Leone and Burkina Faso. 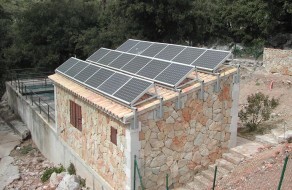 In 2012, solar systems were installed in a total of 50 locations in: Mali, Benin and Niger. During the year, 25 solar energy systems have been purchased and are in the process of being installed in various African countries. 210 locations in Africa were provided with electricity. This year, 25 new systems for Gambia, 10 for Nigeria and 50 for Congo were installed. 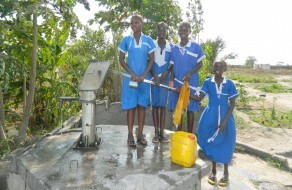 In the last year, a total of 650 water hand pumps were installed. Thus far, 1062 hand pumps have been fitted this year and 247 hand pumps have been rehabilitated. Work is on-going in: Benin, Burkina Faso, Ghana, Gambia, Mali, Nigeria and Ivory Coast, Tanzania, Uganda. Under the Nusrat Jehan Scheme, 41 hospitals and twelve African countries were opened. Apart from this, dozens of health professionals who are members of the Ahmadiyya Muslim Community, travel on a short-term basis to various remote parts of the world voluntarily and work under the supervision of AMJ International to provide medical services. AMJ also employs health professionals; including doctors, nurses and other sectors on a local level to provide healthcare services in its hospitals and clinics. There is an on-going effort to provide better equipment and facilities to all of the hospitals and clinics. People who are unable to afford treatment are offered free treatment in these hospitals and clinics. In poor Asian and African countries, 20,000 people were given medical and general care. 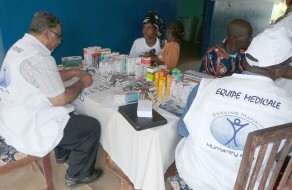 Free medical camps were established in: Liberia, Benin, Ivory Coast, Sierra Leone and Mauritius. In India, dispensaries set up by AMJ treat thousands of people. Free medical camps, free eye camps and free dental camps have treated more than 20,000 people. Blood Drives: The Ahmadiyya Muslim Community makes great efforts to organise various charitable events such as blood drives on a global level in countries including: UK, France, India, Trinidad, Marshall Islands, Germany, Mauritius, Bangladesh, USA and Canada etc. and in various African countries as well. In the USA, a nationwide blood drive was organised by the Community on September 11, to honour the victims of that fateful event. The purpose of holding this particular blood drive was to show loyalty to one’s nation. Various Senators and other key dignitaries attended this blood drive. Thousands of ordinary citizens also showed their support by participating. The blood drives have been very successful. 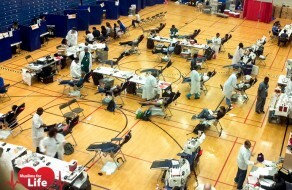 Over the past 2 years, more than 22,000 pints of blood were collected in the USA. Whereas in the UK, over 2,000 pints of blood have been collected. Charity Walks: Charity walks were organised in different countries around the globe in which the concept of charity was promoted and the sentiment to help one another was fostered. The donations raised were granted to different charities. The majority of the charity money was granted to non-Muslim charities. £7 million was raised last year alone. Natural Disasters Relief: The Ahmadiyya Muslim Community is always at the forefront to provide urgent relief to victims of natural disasters. For example, victims of the Fiji flood in 2012 were provided with a large quantity of aid. Similarly, during the famine of North East Africa when 13 million people were affected, AMJ established camps through which flour, cooking oil, lentils (all local foods) were provided. The policy of AMJ is to help and support wherever it is required. Several hospital and nursing home visits were organised on regional and local level all across the UK. Khuddam and Atfal actively take part in such activities and present various gifts like chocolates, fruits, flowers and greeting cards for young children. There have been in excess of 1000 visits in total to various organisations all across the country. Homeless feeding sessions throughout the country in all regions. With the help and support of AMJ, Khuddam and Atfal packed containers of food, then distributed at homeless shelters on a weekly basis. From November 2012 till August 2013, 9,956 packs of food were distributed. From November 2013 onwards, more than 10,000 packs of food were distributed. Supporting the elderly, flood relief & disaster relief programs and hikes for charities; which raised £240,000 in 2013 alone. MKA has organised blood donations regularly and in 2013, 2500 pints of blood was donated. This amount equates to 7500 lives saved. 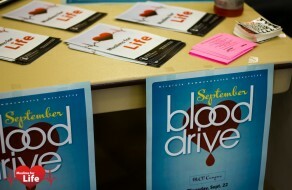 MKA encouraged stem cell donation and organ registration. The purpose is to show the beautiful teachings of Islam mentioned in the Holy Qur’an that saving one life is like saving the entire mankind. MKA has been involved with various tree planting projects. In 2013, 65,325 (18,884 in Spring and 46,441 in Autumn) trees were planted. This year, 67,000 trees have been planted already. Flood Relief Activities: MKA provided tremendous support and help to the hardest hit areas in the UK such as the villages of Somerset; Burrow Bridge and Moorlands. Aid was also provided to: Chertsey, Staines, Wraysbury, Eggham, Datchet, Winchester, Reading and Guildford. Up to 200 Khuddam across the country helped and supported their local communities, councils, police and the army with flood relief efforts. 600 blankets were provided by AMJ for this cause of which more than 500 were distributed. 3000 bottles of water were provided by Humanity First – an internationally established charity to promote and safeguard the preservation of human life and dignity. The organisation was established in the UK and formally registered in 1994 by the leader of Ahmadiyya Muslim Community Mirza Tahir Ahmadrh. In his keynote address at the concluding session of the three-day National Ijtema 2013, of MKA, UK the Worldwide Head of the Ahmadiyya Muslim Jamaat and Fifth Khalifah, Hazrat Mirza Masroor Ahmadaba said, ‘If you are able to improve and reform yourself it will not only benefit you, but it will also be a means of serving your nation and the society in which you live.’ His Holiness went on to quote the Second Khalifah, Hazrat Mirza Bahir-Ud-Din Mahmud Ahmadra, who founded Majlis Khuddamul Ahmadiyya, ‘Nations cannot be reformed without the reformation of their youth.’ By serving others, AMJ seeks to reform its members, particularly the youth, so they can become law-abiding and loyal citizens with a firm zeal to offer a helping hand to anyone in need.